Cool the bread thoroughly and slice with a thin, sharp knife. That is one good looking bread. I make your other banana bread all the time. My family loves it – especially my husband. I will have to try this one. It does look so good in the photo. I spend a lot of time here and appreciate all your sharings. I’ve made four loaves of this since you wrote this post and am making two more this weekend. It is brilliant! 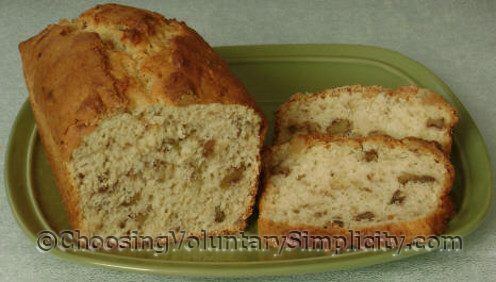 I don’t like ripe bananas, so I don’t usually like banana bread, but this is sooo good. I got emails from four or five co-workers complimenting me on it when I took a loaf to work on Thursday. I pass the compliments on to you!